You may have situations when you need to secure items to carpeting and prevent them from moving or shifting. 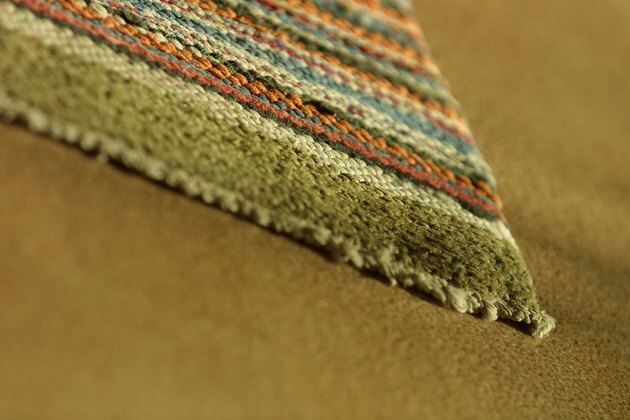 Depending on the type of carpet you have, you may be able to utilize the Velcro brand hook and loop fastener. You can affix the adhesive side to make Velcro stick to carpet as long as the pile of the carpet fibers is not too long. If you have a shag-type carpet with long fibers, you may not be able to use Velcro adhesive strips successfully. Secure objects to carpet using Velcro adhesive. Determine the location on the carpet where you wish to install the Velcro strips. Cut a length of the adhesive strip that will cover the carpet. Separate the loop half and the hook half of the strip and set the hook half aside. Remove the adhesive backing from the loop half of the Velcro strip and press it down firmly onto the carpet fibers. Continue to press the strip along the entire length until it affixes securely to the carpet. Determine the location on the second item that you wish to affix to the carpet. For example, you might be attaching a carpet runner, a doormat or a light piece of furniture such as an ottoman to the carpet. Line up the second item precisely where you want to affix it to the carpet to ensure proper placement of the adhesive strips. Remove the adhesive backing from the hook half of the strip and press the strip onto the item firmly to affix it. Position the item over the carpet, lining up the loop side of the Velcro on the carpet with the hook side of the Velcro on the item. Press the item down onto the carpet firmly to affix it. Pull the item away from the carpet to separate the hook and loop surfaces.